Earlier this year, Google announced the Chomebit: a Chrome OS-based computer on an HDMI stick that could turn any screen into a computer. Now, it’s officially going on sale—and it will only cost you $85. The stick, about the size of a small candy bar and made by Asus,weighs 2.6 ounces and plugs straight into an HDMI slot of any screen that you have going spare. It’s essentially a cheap Chromebook, with the screen and input devices removed, and it provides a neat, portable means of carrying around a computer. The device’s specs are unchanged since the first announcement, so you can expect a Rockchip RK3288 processor with quad-core Mali 760 graphics, 2GB of RAM, 16GB of solid state storage, 2x2 dual-band 802.11ac WiFi, Bluetooth 4.0, and a single full-size USB 2.0 port on one end. You’d probably want to use a wireless Bluetooth keyboard with the Chromebit, given that single USB port. There are clearly plenty of uses for a stick like this. Turn an old monitor into a spare computer. Run an actual PC on your TV. Plug one into the projector in your office or classroom. Or maybe even just toss it in your bag so you always have your own computer with you. But whatever reason you choose to use it, it’s probably worth bearing in mind that it’s not the zippiest of devices: that Rockchip processor and 2GB of RAM can only stretch so far. Also, like any Chrome device, you need a decent internet connection to make any use of it in the first place. 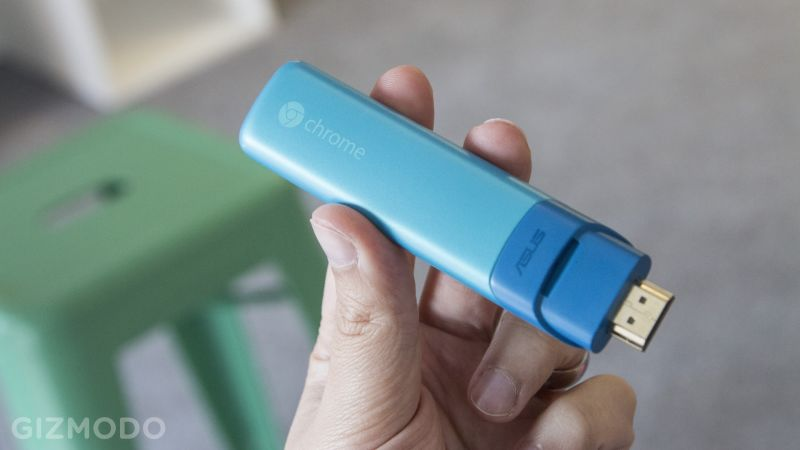 But, if all those caveats don’t put you off, you’ll be able to buy a Chromebit at Amazon, Fry’s and Newegg for $85.